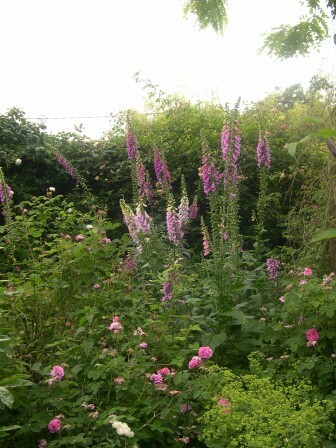 Foxgloves and roses always make a wonderful combination. Own-root roses generally come in containers of various sizes. From small specialty nurseries usually in smaller pots called “bands”. Don’t be intimidated by own-root roses sold in “band pots” as with good care they quickly grow into full sized roses. You will also occasionally hear that “grafted (or budded” roses establish more quickly in the garden. This isn’t totally true. The reason many people feel this way is because most grafted roses are close to three years old by the time you get them. Many own-root roses are sold when they are less than one year old. But once the own root rose is three years old you can’t tell the difference. We strongly encourage you to purchase Garden Roses on their own-roots. In our opinion they make fuller plants. And that is one of the definitions of a Garden Rose. If you have experience with roses, it’s okay to plant the band pot straight into the ground. If you are unsure then pot it up into a larger container, let it grow on and then plant it. Plant the rose about 1″ deeper than the soil level in the pot. This will anchor the rose more securely and prevent “wind rock”, which is when strong winds whip the plant around. As with any new planting water in very well after you plant it. To Bud or Not To Bud. An article that appeared in the “Novice Corner” section of the Tinseltown Rose Society’s newsletter. Own-Root vs Grafted Roses – in the “Getting Started” section of our website. There is a video that explains the difference.